PG Madhavan, Ph.D., has 20+ years of Data Analysis experience and developed his Analytics expertise as an EECS Professor, Computational Neuroscience researcher, Bell labs MTS & Microsoft Architect. He blogs regularly, has many publications & presentations to Sales, Marketing, Product and Research groups as well as 12 issued US patents. He has played key roles in four startups with two as Founder. 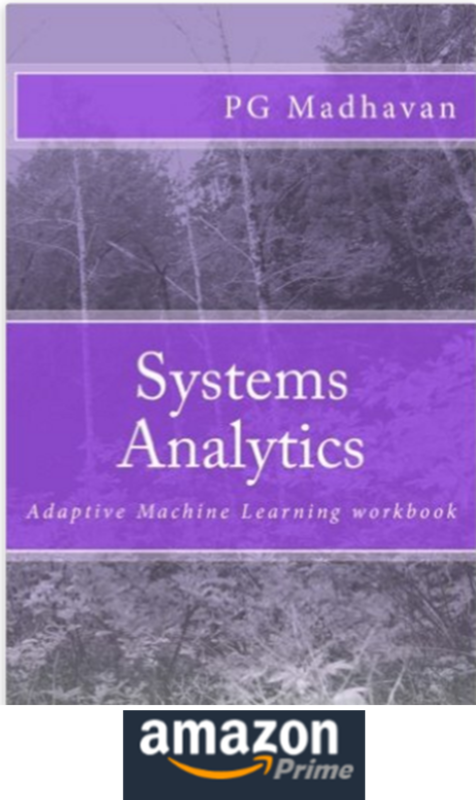 "SYSTEMS Analytics: Adaptive Machine Learning WORKBOOK"
SYSTEMS Analytics title refers to a new development effort in the field of Machine Learning grounded firmly in Systems Theory; the subtitle, “ADAPTIVE Machine Learning”, captures the link to the current state of the art. My intention in writing this book is to bring mathematically trained graduates in engineering, physics, mathematics and allied fields into Data Science. It is a WORKBOOOK with MATLAB code that creates a common framework and points out various interconnections. This will allow you to connect your past knowledge to Data Science or Machine Learning or Analytics as applied to business. My hope is that the interconnections exposed will inspire you to develop many new algorithms that will turn out to be of “industrial strength”.